John Griffin has a unique combination of knowledge and experience in the worlds of law and business, with 25 years focusing on litigation, secured lending and serving as outside general counsel for growing businesses. John is a quick study who searches for the most practical solution to legal and business problems. He has started and served as CEO of a real estate construction and development business and as President of a European product importation and distribution business. 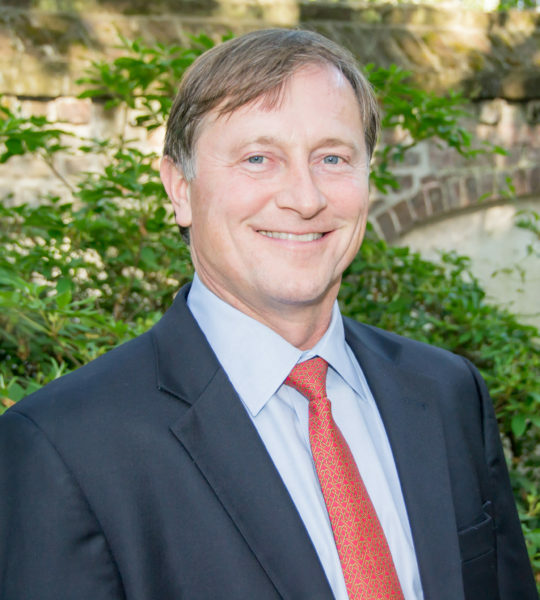 A native of Spartanburg, John graduated Phi Beta Kappa from The University of Virginia in 1982 and earned his law degree in 1986 from Columbia University Law School in New York, where he was a Harlan Fiske Stone Scholar. Upon graduation, he joined the Corporate and Securities Law team at Baker Botts in Houston, where he worked on the $10 billion Pennzoil v. Texaco lawsuit and several corporate takeover transactions for T. Boone Pickens. John moved to Atlanta in 1988 and joined King & Spalding, where he worked in the Commercial Transactions section, including representing an Italian bank in a fraudulent scheme by a rogue Atlanta branch manager who loaned over $4 billion to Saddam Hussein. John developed The Adair Estate, an Urban Design Award-winning condominium project in Atlanta’s historic Druid Hills. In 2003, John moved to Charlottesville, Virginia where he enjoyed a broad legal practice, including litigation, secured lending, real estate, tax, intellectual property, business planning and transactions, estate planning and serving as General Counsel to growing technology companies. John moved to Charleston in 2013. John enjoys helping people achieve their business and personal goals and efficiently resolve their legal disputes. He brings his broad experience as a business attorney, litigator and businessman to bear in his Counseling and Mediation practice. John is a certified Circuit Court Mediator and is rated by his peers AV Preeminent (5.0), Martindale Hubbell’s highest rating. John speaks Spanish. John and his wife, Margaret, are active in St. Peter’s Church in Mt. Pleasant, which Margaret founded in 2005 and where John leads the Honduras Missions team. He enjoys swimming, biking, hiking and skiing.